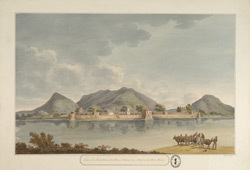 Water-colour painting of Sidhout Fort by Thomas Fraser (1776-1823), c.1802. Inscribed on the front in ink is: 'View of the South Face of the Fort of Sidhout, from a Bank in the River Pennar. T. Fraser, Engr. '; and on the back in ink: 'E.No.4.' Fraser served with the Madras Engineers from 1796 to 1823. During 1802 he appears to have been inspecting and surveying forts in the Ceded Districts of Bellary, Kurnool, Anantapur and Cuddapah. Later in 1803 he became Superintending Engineer of Public Works for the Madras Presidency Division. Sidhout Fort is located c.25km to the east of Cuddapah town in Andhra Pradesh. The fort was built c. 1303 but was severely damaged when it was attacked by Hyder Ali (c. 1722-1782) in 1770. There are two majestic gateways to the west and east of the fort and a main gateway with pillared and artistic carvings of Gajalakshmi at the top.